(CNN) Sun, sand and a large body of water. Check, check and check. Those are the basics of any trip to the shore. But some of the United States&apos; protected coasts and lakeshores are cozied up near towns with their own unique appeal. These seven towns, located within easy reach of national seashores and lakeshores, range from quirky art hamlets to rugged fishing villages. A visit to these spots means you can work on your tan with sides of seafood, history and culture. 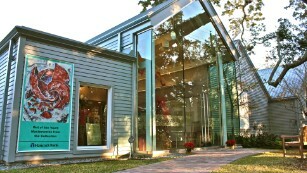 The Walter Anderson Museum of Art&apos;s permanent collection features work by the Anderson brothers. WAMA, as it&apos;s called here, celebrates the Anderson family, Ocean Springs&apos; hometown art heroes. Walter Inglis Anderson was a prominent painter, brother Peter Anderson founded the city&apos;s Shearwater Pottery and James McConnell Anderson was a local ceramist and painter. The museum&apos;s permanent collection features a range of work by the three brothers and rotating exhibitions bring in work by other artists. After taking in WAMA&apos;s watercolors and carvings, smoked wings, catfish po&apos; boys, Big Larry&apos;s baked beans and live music await at Murky Waters Blues and BBQ (1212 Government St.).